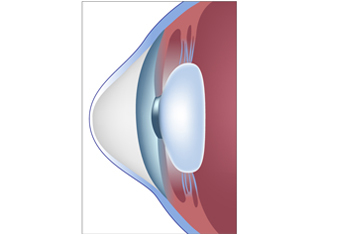 The front of the eye, known as the cornea, is the most important focusing component of the eye. Typically spherical in shape, it allows the person to see a clear, sharp image of the world. Keratoconus is a progressive disease that causes a gradual change of the corneal shape from a sphere to a cone. With this “coning” of the eye, the person’s vision gets worse. At the early stages, it presents as a worsening astigmatism or increased distortion in vision that can initially be corrected with hard contact lenses. If left untreated, as the disease progresses, it can cause permanent vision loss requiring corneal transplantation. WHO CAN BE AFFECTED BY KERATOCONUS? Keratoconus affects both males and females of all races. Although there is significant variability in when and how it presents, it typically begins around puberty and worsens over the course of 20 years until it stabilizes. There are exceptions where it begins earlier or takes longer to stabilize. The estimated prevalence of Keratoconus in the population is higher than 1 in 1000. First degree relatives of patients have a 1 in 20 chance of developing the disease. WHY IS IT IMPORTANT TO DIAGNOSE KERATOCONUS? We now have treatments to not only correct Keratoconus but also to halt its progression. With early diagnosis and treatment, vision loss and more involved corneal transplantation surgery can be avoided. At the Herzig Eye Institute, we provide full care and follow up for all stages of Keratoconus whether it is mild or severe, early or late. The Herzig Eye Institute uses advanced technology to map the cornea and monitor the progression of Keratoconus. If you require treatment, we can provide full care that is tailored to the stage of your disease and your needs.